A Pendulum art book preview! MonMon Memo is back, and for the 14th update, they've decided to go over some elements of the upcoming Digimon Pendulum art book in a Production Status Report. 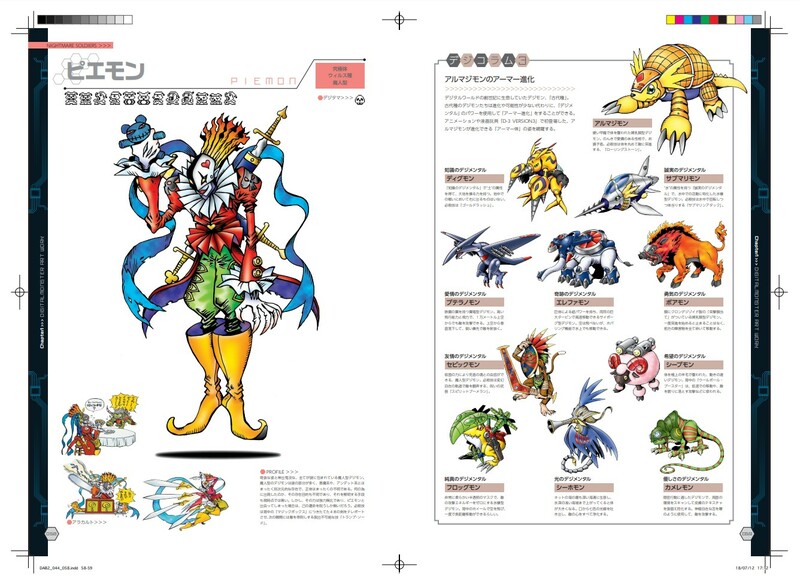 In addition to Digimon from the Pendulum series and the Pendulum Version 20th series, they have illustrations of the X-Antibody Digimon from the Pendulum X in the art book. There are more than 300 Digimon total, a decent chunk more than the art book from last year. While still being worked on, they have sample pages they want to share. 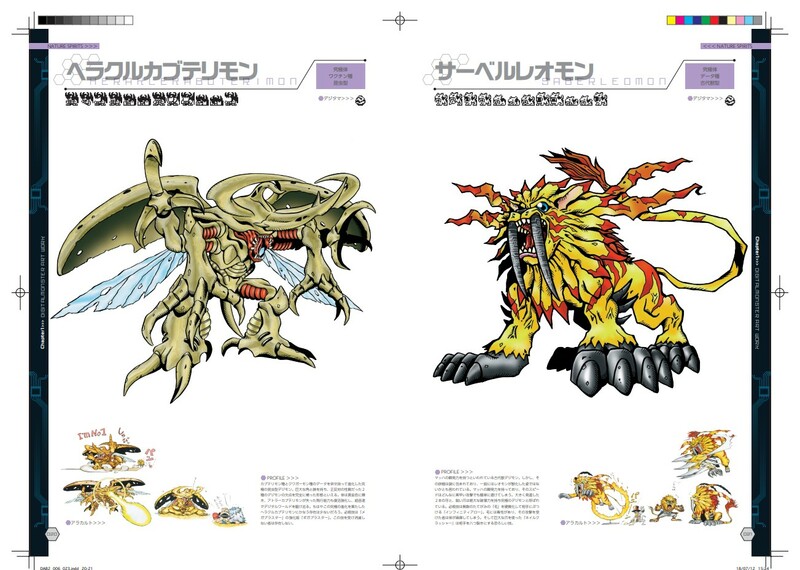 The first is the layout sample of HerculesKabuterimon and SaberLeomon at the top of the article. Then there is also a preview of the page for Piemon, along with a page featuring Armadimon and his various armor evolutions. They point out you can see the details that make up the power of the Digimon's designs. Plus there will be a number of articles. But they also want to make sure we know that the various illustrations won't be the only highlight of the book. In the photo you can see them going over various pages from the Pendulum art book. They appear to be comparing them to pages from the art book from last year, along with old Pendulum booklets. There will be details of the Pendulum plan from at the time it was made. There is a story from Bandai's Big Dreamer Taoka, Mr. Maekawa (this appears to be Atsushi Maekawa, who wrote quite a bit of early Digimon material, including being one of the series composers for 02 and the person who wrote most of Impmon's development in Tamers), and Kenji Watanabe. The story of the early development was told via an interview Big Dreamer Taoka conducted just the other day. They will also touch on (just a bit) the development of future Digimon toys, so they think this will be an interesting interview for fans. In addition, the columns/articles will be filled with interesting planning pages featuring Armor Digimon, along with the cute Digimon illustrations that they've been posting to Twitter. Next week's MonMon Memo will be Digital Monster Art Book ver. Pendulum Production Status Report 2. The Digital Monster Art Book Version Pendulum is still available to order. Details can be found here. Silver Black Special Digi-Eggs, Plus ones in both! Wow to bad I can read Japanese but still I’ll pick this gorgeous book up just because of the art. Really hope they are teasing a Pendulum Progress ver 20th. Although I get the feeling they might drop it and just go straight to the Pen X or do something else entirely. I think that once again the thing I'll be looking forward to most are those humorous illustrations in the corners of the Digimon pages. It appears that in one of them Piemon has the chainsaw he uses in the Adventure novelization. I can't tell who he's about to saw in half, though. that in one of them Piemon has the chainsaw he uses in the Adventure novelization. I can't tell who he's about to saw in half, though. I'm super excited! Still wish they'd cram more illustrations into all that white space though. Will the armor evolutions even be large enough to make out like this? Seems strange to have full-page images and then little ones. Nice stuff as usual. If there's one thing that surprises me it'S the mention of the cute twitter artwork. It's not my style but it will be interesting to know where it came from since a few of the earlier ones seem like they were done quite a while ago but others are obviously new but before the twitter I don't recall them ever being used heavily... so maybe there's some interesting background stuff there. Will the armor evolutions even be large enough to make out like this? It's a big book. Those "little" illustrations already have more detail than what we normally get. At least Shadramon and Mambomon will be getting full pages, though. Since they're in the Pendulum 20th. Pokémon fan at heart, but growing to like Digimon. wait, there's sistermon in the first artbook? where? ?